As an attorney, I am asked if there is a legal way to eat sea turtles. I know of no way, and the government will jail someone for a felony for merely handling a sea turtle. If you are a U.S. citizen, then you can eat sea turtles if you leave the U.S. to visit countries that are more libertarian about turtles (Cayman Islands, Jamaica, Cuba, etc.). Grand Cayman Island has a famous turtle farm selling meat (for popular dishes in restaurants) and shells. The farm brings turtles closer to everyone’s heart (inside the stomach). The U.S. government imposed socialistic laws that almost destroyed the farm. Bureaucrats are more cold-blooded than turtles. If you are from the U.S., then your government will confiscate your turtle property when you return, and that is the least that your U.S. Customs will do to you. The U.S. wasn't always a socialist police state. The U.S. led in liberty, property rights, farming, and free markets. U.S. laws might change, but don't bet the farm on it. Liberty helps turtles and the people who love them (to eat). U.S. Socialism hurts sea turtles. The lack of property rights in turtles and in so many waterways prevents turtle aquaculture. New car tags ( http://rexcurry.net/ecotags.html ) tout the libertarian solution. The section above (minus the urls) is a synopsis that contains 250 words or less, and served as a popular letter to the editor. The letter has also been published as a longer article by including the additional information that is below. Some turdles float on the surface. Other turdles sink to the bottom. But under socialism, everything is flushed down the toilet. In Florida and elsewhere, gopher turtles are eaten. Foreign turtle farms are saving turtles from U.S. socialism. The capitalist Cayman farm releases tagged turtles that have been found in the socialized waters of the U.S., as well as Venezuela, Nicaragua, Panama, Mexico, Honduras and Cuba. U.S. laws deprive citizens of economic and personal liberty as well as research, scientific knowledge, aquaculture expertise and marketing skills that the Caymans gain over us. Cayman Turtle Farm started in 1968 as Mariculture Ltd., by a group of investors from Great Britain and the United States. The intention was to supply the market with a source of product that did not deplete the wild populations further. The turtles were on their way to extinction until the Turtle farm opened. Much work was done pioneering the domestication of turtles. Then, the U.S. exported its lethal socialism internationally. Regulations prevented the sale of even the farmed turtle product in the U.S. and many other countries. Eventually, the U.S. government under the CITES convention (Convention on International Trade for Endangered Species) banned all turtle products through U.S. ports. The farm lost 80 percent of its market overnight. With 100,000 turtles to feed and care for and unable to sell products to U.S. citizens who were willing buyers, Mariculture Ltd. went bankrupt in 1975. In 1975, the first turtles raised from eggs obtained from the wild had reproduced. New owners tried but export restrictions continued and revenue could not maintain the 100,000 turtles on hand. After 8 years the new company gave up. The number of turtles was reduced and operating costs brought to the minimum with the intention of closing. The Cayman Islands Government then purchased the mini farm in 1983 and has since operated it as a private company, Cayman Turtle Farm (1983) Ltd. The U.S. government nearly destroyed a private enterprise and almost replaced it with rank socialism. The farm started with Green Turtles but also uses its knowledge to raise other endangered turtles: loggerheads, Kemp’s ridley, and hawksbills (the source of the coveted “tortoiseshell” for ornaments and jewelry). The farm is still hoping for a change in the regulations. There is a rising stockpile of turtle shell waiting for a commercial market. There may not be a market any longer due to the length of time that the U.S. government has imposed socialism. The U.S., through its acts, has also increased poaching of wild turtles worldwide. Various options are being considered by the farm. At one end of the continuum is bulldozing the tanks and selling the land for real estate, or other commercial development that will have absolutely nothing to do with propagating animal or plant life. The U.S. government destroyed turtles in the U.S. also. The Turtle Kraals Restaurant in Key West is where turtle corrals were used for commercial turtle farming and the first Key West Turtle Cannery opened in 1849. It stopped in 1970's under the same laws that harmed the Cayman farm. The restaurant has a small museum about the good-old days of turtle farming, back when government was smaller. Although the restaurant no longer serves turtles, it serves other farmed animals, including chicken, beef, and farmed fruits and vegetables, and even other seafood, farmed or not. The restaurant also serves conch because Key West is the "Conch Republic," named after what used to be a local dish. U.S. laws prevent conch from being harvested or farmed in the U.S. though conch can be imported (even from the Cayman Islands), and turtle cannot. All conch served in Key West is foreign. Key conchs and turtles were eaten by my ancestors, the first settlers in Key West. The Curry Mansion is still on the local tour, as the former home of Florida's first millionaire capitalist. As a sixth generation Floridian and a lifelong resident, I treasure Florida’s environment. As a Key West "Conch" I know that the key to turtle recovery is capitalism. As an attorney and a renowned sea turtle expert, I deal with environmental laws including criminal charges. I have traveled to Grand Cayman Island as a capitalist eco-tour to examine the sea turtle farms and to eat sea turtles in every manner that they are prepared. Laws that ban turtle trade are a gross injustice over the “tragedy of the commons” in government-owned waterways. Much U.S. water is socialized and Florida land is 30 percent socialized (government-owned). It is trademark socialism with government-ownership, unavailability of goods, official bans, and police-state tactics. On the socialist farm, humans are property and the result is shortages, poverty, misery, and eventually starvation and mass slaughter. In the Union of Soviet Socialist Republics 62 million humans were killed; the Peoples' Republic of China, 35 million; and the National Socialist German Workers' Party, 21 million. (see http://rexcurry.net/socialists.html ). Socialism destroyed cows, chickens, sheep, and grain-fields by the millions, and then it killed humans, who were treated like animals too. Turtles are cold-blooded, but not as cold-blooded as socialists. We the sheeple must fight our socialist farm. How many millions of turtles and conchs etc., have died (and have never been born) because of soggy socialism in the U.S.? It is an anti-capitalist genocide that endangers humans too. Americans must stop hiding in their shells and demand liberty. Thank goodness the U.S. government is different toward most farmlands, foods and goods, or else the disaster would spread. Chickens and cows would be extinct if socialists had “helped” them. Private property rights enable farming that keeps chicken, cattle and many popular forms of restaurant fish off endangered species lists. The U.S. government is making sure that turtles and conchs never become as common as poultry and beef. As long as turtle habitats are socialized, there will be little incentive to release turtles into the wild, and great incentive to take as many socialized turtles as possible, whenever possible. Farming would produce bigger and better turtles, and more of them, with improved quality and flavor. With property rights in waterways, the abundance and prosperity that inures to land farming, will inure to all seafood. Sea turtles can become as popular and abundant as other farmed seafood, meats, fruits and vegetables. The many “seafood festivals” will add turtles to the festivities. The former Union of Soviet Socialist Republics, Eastern Europe and Communist China proved that socialism is environmentally disastrous. Turtles and conchs prove that socialism is environmentally disastrous in the "Land of the free." Instead of socialist restrictions, Florida waters need capitalist expansions. Let’s fight the government’s antidisestablishmentarianism. Privatize and enlarge the everglades. Let liberty dive deep. The best environment is a capitalist environment. Turtles prove that the color of a healthy environment and the color of money are the same. Mother Nature is a capitalist. Capitalists are the true greens. Some of the sea turtles on the farm are enormous, 200+ pounds. Someone should move some of the turtles to Stingray City (another tourist attraction on a sandbar off Grand Cayman Island where wild stingrays cavort with humans) so that people can cavort with turtles and stingrays in the water. The sea turtles are so large and powerful that people could hitch a ride in the water. Riding stingrays isn't done at Stingray City, probably because a stingray's tail would be in a very sensitive spot on a human rider. Sea turtles taste heavenly. The taste proves that the U.S. is not only a police state, but also a police state with bad taste. If the U.S. ever ends the ban, then it will start subsidizing turtle farming, and eventually mandate it with socialized turtle farms. And farmed turtle is better because it is more tender. Wild turtle is known for requiring marinating, pounding and various techniques for tenderizing. Farming provides turtle of more consistent quality, size and flavor. Sea turtles were used in history for meat, bone, hides and fat. Sailors could carry them on long voyages because they could live on board ships. Today, capitalists can farm sea turtles by fencing them or by the more modern method using “homing” tags (transponders) to own and track turtles as private property on open waters. The survival rate for turtles at the Cayman farm is nine times higher than in the wild. Even when turtles are released into the sea, they often become dinner to non-humans. Raccoons and other non-human predators legally eat turtle eggs in the wild. Sea Gulls and other non-human predators legally eat baby sea turtles. Alligators, Caiman and other endangered species are predators that eat larger turtles. Only humans are arrested and jailed even for approaching a nest. 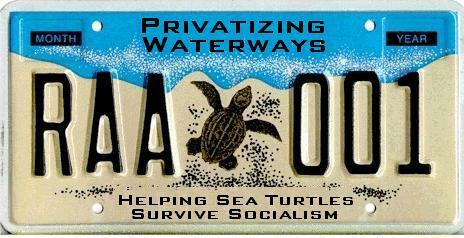 COLORFUL CAR TAGS laud private waterways and pan soggy socialism. save nature from socialism. SOCIALISM KILLS CRABS - your choice: stone crabs or blue crabs. I love sea turtles. They taste just like chicken. Sea turtles taste just like chicken. Sea turtle tastes just like chicken. Sea turtle tastes like chicken. Sea turtles taste like chicken. I love sea turtle. It tastes just like steak. Sea turtle tastes just like steak. Sea turtles taste just like steak. Sea turtle tastes like steak. Sea turtles taste like steak. I love sea turtle. It tastes great. I love sea turtle. They taste great. I love sea turtles. They taste great.